Find your place in the sun—and by the sea—at this Bed & Breakfast guest suite featuring 180-degree ocean views from its lounge and bedrooms. The deck provides the perfect setting for sipping Waiheke wines and admiring magnificent sunsets and the lights of Auckland glittering in the distance. 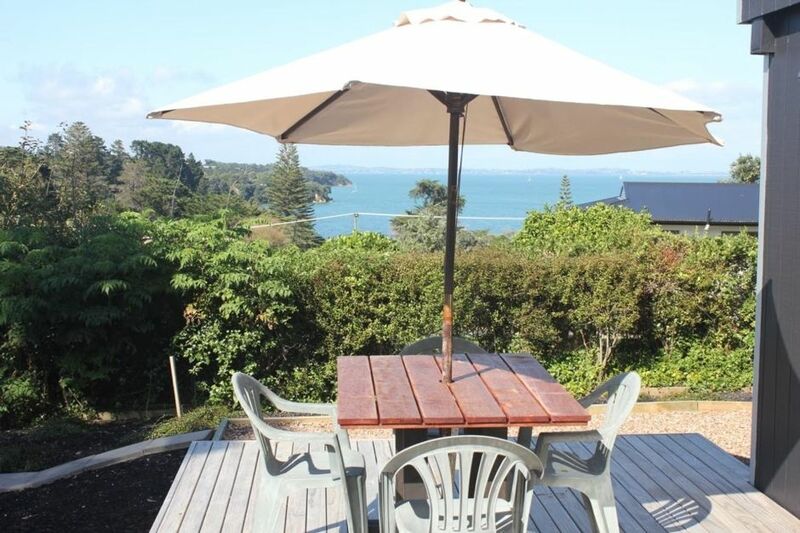 With a great indoor-outdoor flow, this charming Waiheke holiday rental allows guests to relax and mingle with ease: Lush trees provide shade - plus the distinctive sounds of tuis and other native birds. An electric fireplace keeps things cosy in winter. Centrally located and on the main bus route, a 3 minute drive from Kennedy Point car ferry and 7 minutes from Matiatia. Walk 5 minutes to Stefano’s Pizzeria, Malone’s Irish bar, Frenchot cafe, a dairy, hairdressers, local bakery and to the local beach. A few minutes drive to Oneroa beach, shops and cafes. In the opposite direction, Goldwater Vineyard, wine tasting and lunch also in walking distance. Drive to the supermarket and a few more minutes to the Onetangi golf course, tennis courts and fabulous Onetangi Beach and cafes. Min 4 nights over Christmas New Year (Dec 20th - Jan 10th). 1 night booking available - nightly rate + $75 surcharge - on request. Excellent for two couples with great outdoor areas.